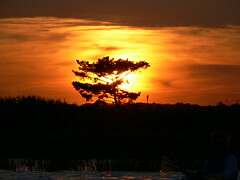 We'll start out paddling west as we watch the sun set gloriously over the horizon. 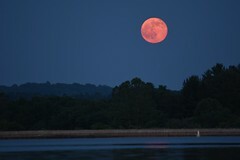 Then we will head east to witness the majesty of a full moon as it rises above the horizon to light up the night sky and shimmer gracefully upon the water surface. This paddle is sure to make your weekly highlight reel. New Jersey's second largest reservoir is home to some stellar sunsets. Hot air balloons frequent the evening skies along with eagles, heron and osprey too. 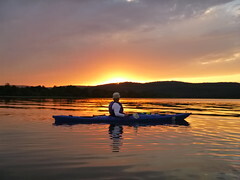 Cap off your day with a quiet, relaxing paddle and some incredible scenery. With a spectacular view of Manhattan, Liberty State Park is one of New Jersey's most dramatic parks and one of our favorite launch spots. We'll depart from Liberty State Park, paddle out into the Hudson River and circumnavigate Liberty Island. 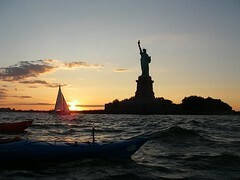 As the sun sets behind her, you'll get an up-close view of Lady Liberty from the cockpit of your kayak. Bring your camera for this unique photo opportunity. Note: If you are going to use your own kayak on this tour it must be at least 13 feet long and spray skirts are mandatory.